Leighton Machine & Tool, Inc. is an Iowa CNC & Tool & Die shop providing custom machined parts through Machining, EDM, Grinding, Milling, & Turning. Early spring, we set out for a mini road trip to Lewis, IA, to meet the team of Leighton Machine. We did our basic research, knowing that they were a custom machined parts and tool & die shop so we weren’t expecting the most elegant of offices. Boy, were we surprised. The Leighton shop was in immaculate condition and very-well organized. 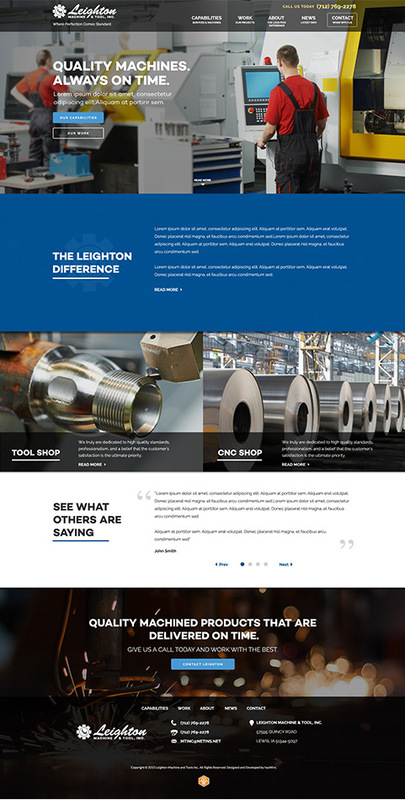 It was apparently obvious that their old site did not accurately represent the Leighton shop and team. In addition to that, they wanted to spruce up their logo, while keeping a few of the main features from the old one. Because it’s common to work remotely in the custom machine and tool industry, they needed to increase their search engine rankings to include a larger portion of the Midwest. They also wanted a site that was easy to upload new projects and display these projects in a unique and organized fashion for their prospects and clients to view. With a new site in the horizon, Leighton needed an updated logo to match. We stayed true to their former logo and simply added a few modern touches. So in the end, they got a new logo and updated color palette that essentially formed the design elements of their new site. The colors were fresh and the layout gave more emphasis to photos of their shop and their work. We enjoyed working with Leighton and we think many would as well.